Professional, friendly and reliable service for the caravan and motorhome owner. 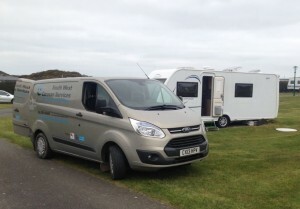 If you are looking for mobile caravan servicing in Devon and Cornwall then South West Caravan Services can offer a range of services for the touring caravan owner. This includes all types of caravan servicing, caravan repairs and exterior caravan washes. South West Caravan Services can also offer customers caravan motor mover fitting and repairs. 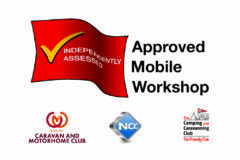 As part of the Approved Workshop Scheme (AWS), our caravan servicing and repairs are carried out to National Caravan Council (NCC) standards and can be easily completed at your home, place of work, storage facility or whilst on site during your holiday. Please see Our Services page for full details of what we offer. South West Caravan Services has many years’ experience carrying out mobile caravan servicing and caravan repairs across Devon and Cornwall. Our mobile caravan engineer will try to solve most of your problems on site, saving you time and enabling you to enjoy your holiday with minimal disruption. South West Caravan Services can offer customers mobile caravan servicing in Devon and surrounding areas. We are conveniently based in Barnstaple, North Devon, with easy access to Woolacombe, Croyde, Braunton, Bideford, Bude, South Molton, Ilfracombe, Torrington, Lynton and further afield. In addition to this, South West Caravan Services are regularly visiting most areas in Devon, Cornwall, Somerset and sometimes even Dorset. With this in mind, South West Caravan Services will always try to meet a timescale that suits the customer. We have regular customers from Exeter, Tiverton, Taunton, Plymouth, Helston, Newquay and everywhere inbetween. So whether your caravan is due a full service or you need an urgent caravan repair whilst on holiday, please feel free to contact us by phone, email or through our Contact Form and we’ll do our very best to help.